GIGABYTE Tech Daily: Anandtech Recommends The GIGABYTE GA-Z170X-Gaming G1! 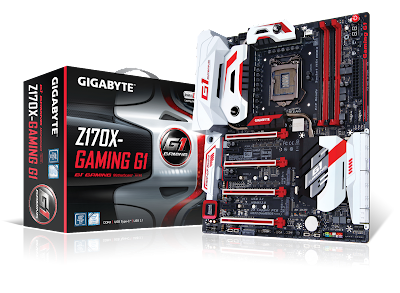 Anandtech Recommends The GIGABYTE GA-Z170X-Gaming G1! When we launched the GIGABYTE GA-Z170X-Gaming G1 motherboard we were very excited about the potential of the Z170 chipset from Intel® and what it would mean for gamers. Personally we think that our new 100-series boards powered by the Z170 chipset are some of our best work yet, but we're a little biased. Recently Anandtech posted a review of our GA-Z170X-Gaming G1 motherboard and gave it a Recommended by AnandTech award, proving that this board really is something special. Anandtech's Ian Cutress liked the hefty feature set, enhanced overclocking support, and BIOS, calling the board "GIGABYTE's halo" of the 100-series board family. At the end of the day, this is GIGABYTE’s halo motherboard for Skylake based systems. It will be one of the key elements in a system integrators high end build, and provides any gamer with enough features to be satisfied with a powerful rig. The competition is tough in this space, the volume is low, and GIGABYTE is making strides in most of the areas we have previously been cautious of in the past. Needless to say, even when considering the price, the Z170X-Gaming G1 would be a good foundation for that gaming PC you’ve saved up for. It’s worth a recommendation and GIGABYTE should be proud with what they’ve produced. To read the full review head on over to Anandtech.